Shadowy figure of Giuseppe Ferrara (G.cam). ‘The truth of the story lies in the details,’ wrote American writer Paul Auster. I’ve only actually met Giuseppe Ferrara twice, the first time being in Westward House on Wednesday 4th May where he was talking to Hayley Temple. In the course of a conversation about the history of the building, he said he had photographs I might find interesting. Most particularly of the Hall ceiling. Of course I was interested and was thrilled to bits to hear on May 12th that Paul Hunter, the Contract Administrator, had given the ‘ok’ for any of Giuseppe’s photos taken while acting as Clerk of Works to be used in HighTimes. Because of this, I can now fill in gaps in the story regarding things happening to the building in areas beyond my reach. 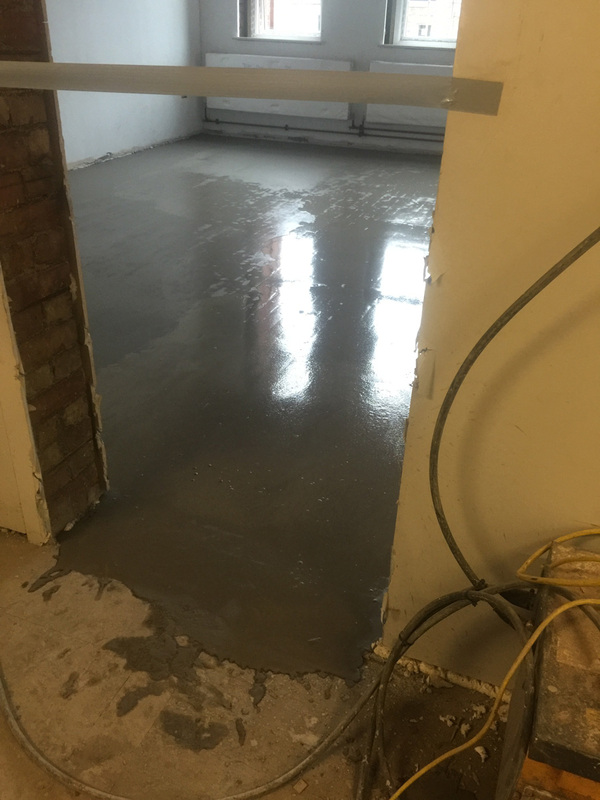 New floors were being laid in the old building first floor classrooms on 22nd March 2016. 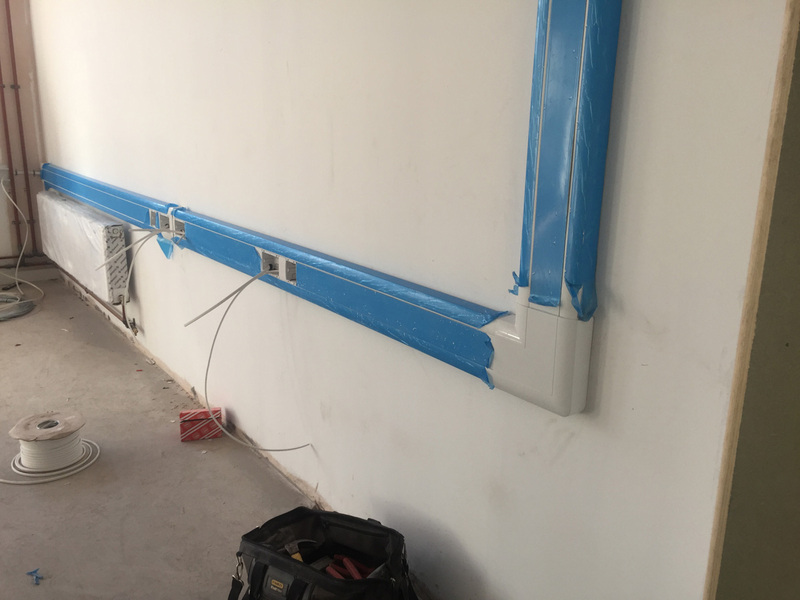 And the electrical sockets were being installed by March 31st. Quite literally, anything up on the roof is clearly beyond the reach of me and my camera and it has been entrancing to see shots that have been taken up there. I will share more of them in the future, but it was at about this time that Giuseppe photographed what I have always called the ‘Little Bell Tower’ on the south gable. I now know its real purpose, but I’ll save that story for a later historical post. Up close, the distinctive, vented ‘Little Tower’ looks simply fantastic. Up close, the ‘Little Bell Tower’ is not so little. As you can see, the structure is a combination of lead and wood. Its ‘roof’ is certainly a lot more sculpted than I’d realised. The dome of the main Bell Tower seems to have been an octagonal cupola, but this one is four-sided. In architectural terms, a cupola is a structure that sits on a larger rooftop or dome. They can range in size from very basic and small, to extremely large and ornate. The small ones can be as simple as the vented boxes you often see on barns which are constructed with no access from inside. This is the category ours falls into – though with far greater ‘kerb-appeal’, clearly. 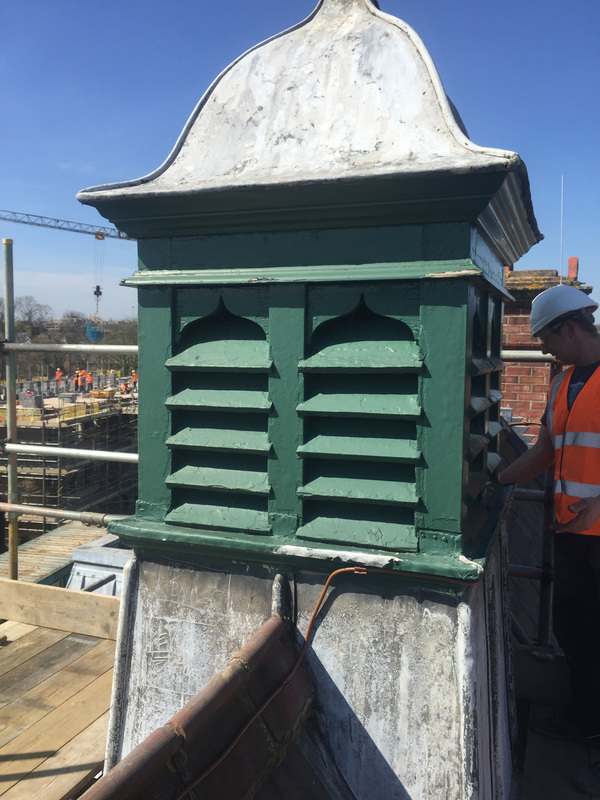 According to the Architectural History of the Cupola, a cupola’s main function is to provide ventilation, removing moist air from the main building. The wooden vents on ours suggests it was designed to do this too. 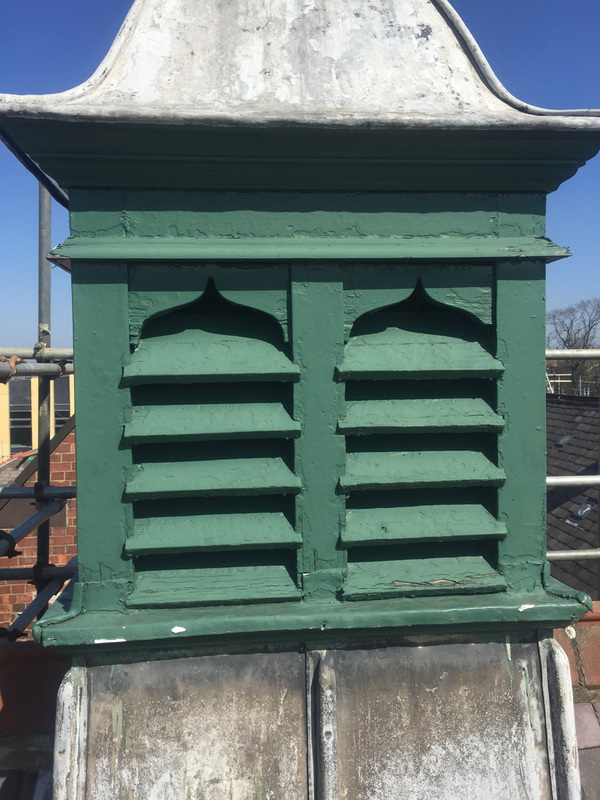 Detail of ventilation slats on the roof cupola. 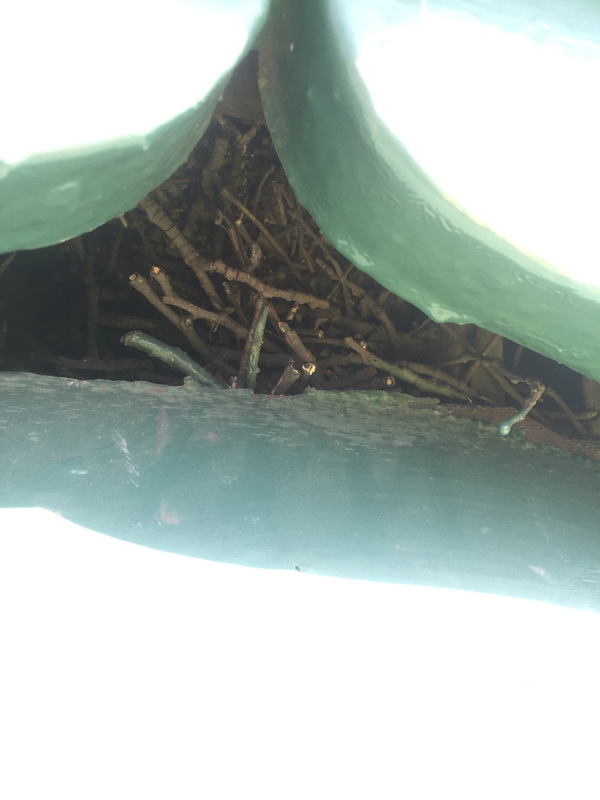 I’ve always thought the structure rather reminiscent of a dove-cote and from Giuseppe’s close-up shots it appears that birds have indeed used it for nesting purposes at some time. Lovely to see. Nature has its own very natural way of filling up the gaps in things. 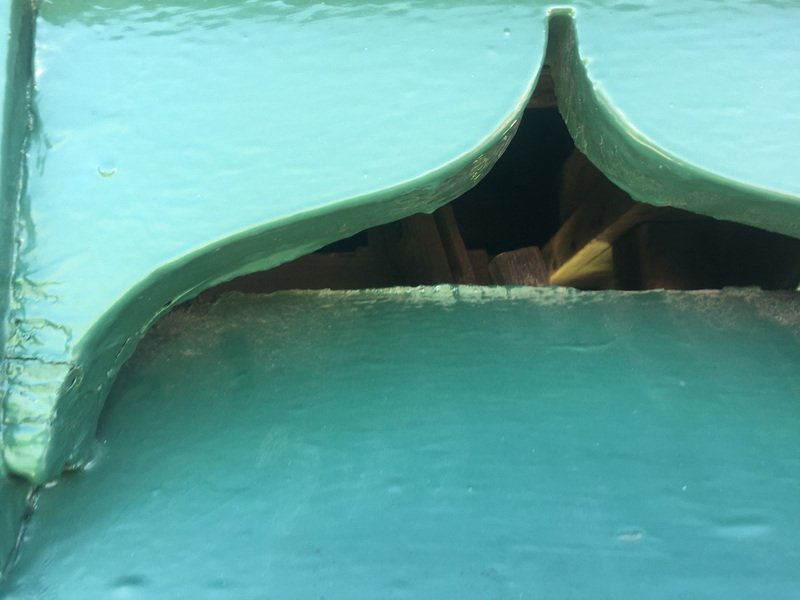 Close-up details of the vent apexes provide a glimpse of the internal structure and that birds have used one for nesting. You may remember from an earlier post that the third floor of the north extension was added after the rest. 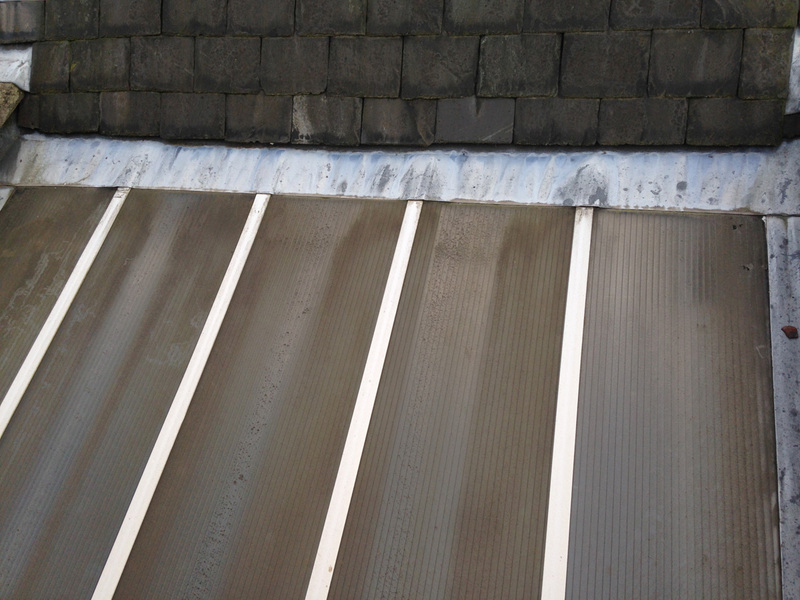 Because of this, a 1950s flat-roof had to be joined to the gabled main building at roof level. To do this, a connecting section was created at the top of the north staircase, a heavy-duty clear plastic fanlight. Unless you looked up, you may not have been aware of it, but you certainly benefited from the light it let in, as did my favourite picture at the top of the stairs. The north extension roof in May 2015. The connecting plastic stairwell fanlight is clearly visible top right (Google Earth). 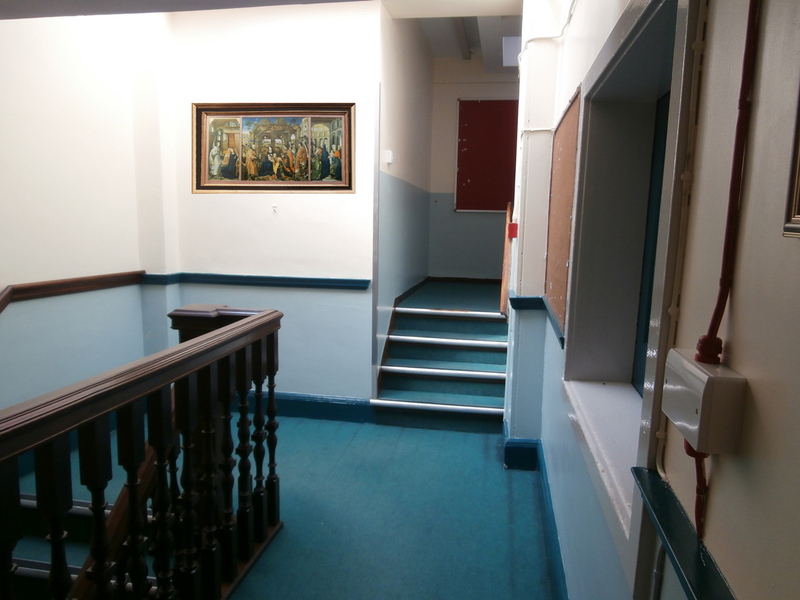 The top-lit top corridor stairwell and the Adoration picture. I also have other less pleasant memories of that same fanlight. Do you remember June 28th 2012, ‘Thunder Thursday’? I certainly do. My house flooded that evening and things would have been a lot, lot worse if I hadn’t seen the dark, lurid greenness of the sky through that very fanlight, heard the first heavy drops and headed for home. Nonetheless, I ultimately had to move out of the house for 3 months while it was repaired and had only been back in properly a month when the merger was announced. 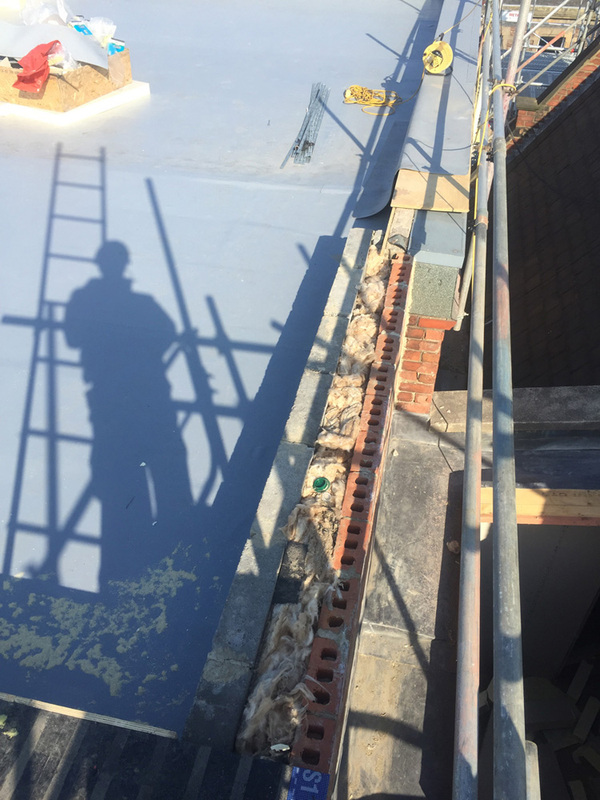 So I had first hand experience of the strip-out and reinstatement process long before I started to document this journey. Consequently, it’s been a tough four years. 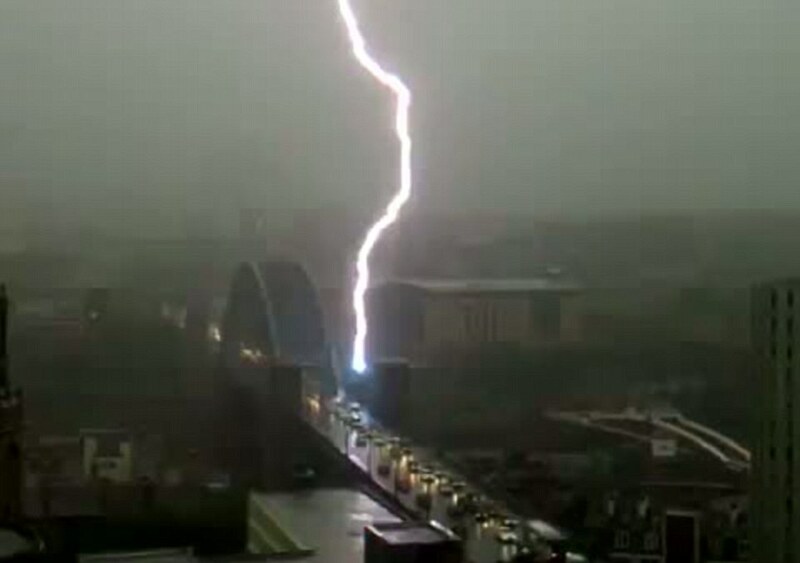 Lightning striking the Tyne Bridge, ‘Thunder Thursday’ 2012. 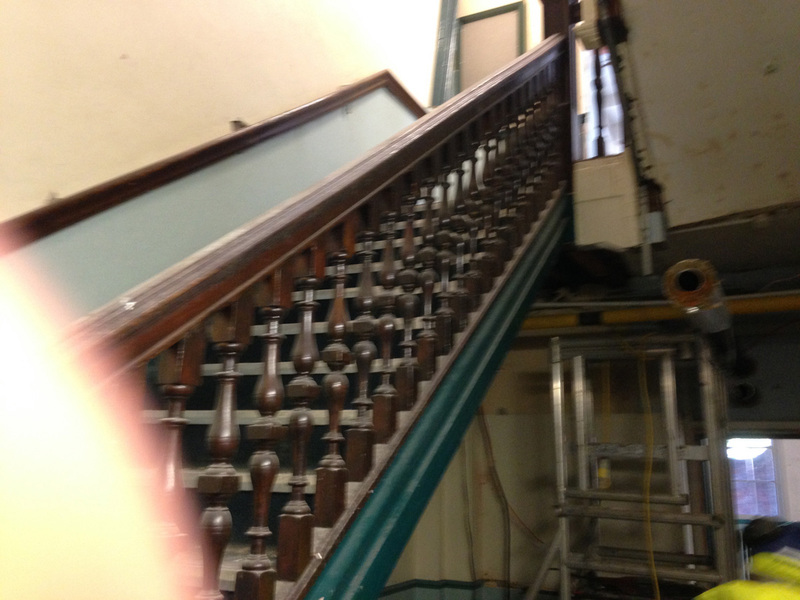 The stair fanlight as photographed on 8th October 2015. Wates had been in possession of the building for two months when Giuseppe took the photograph above on October 8th. 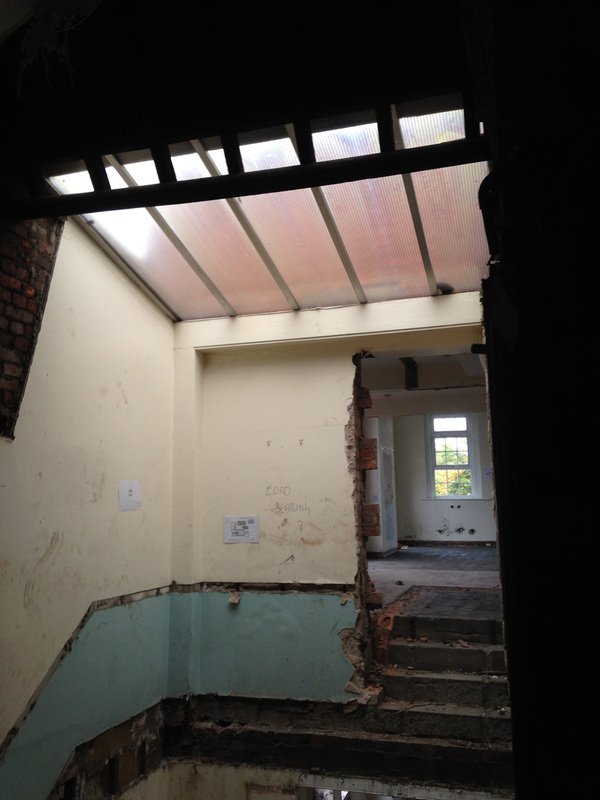 The internal strip-out was already well underway by then and the photograph below must have been one of the last images taken of the staircase. 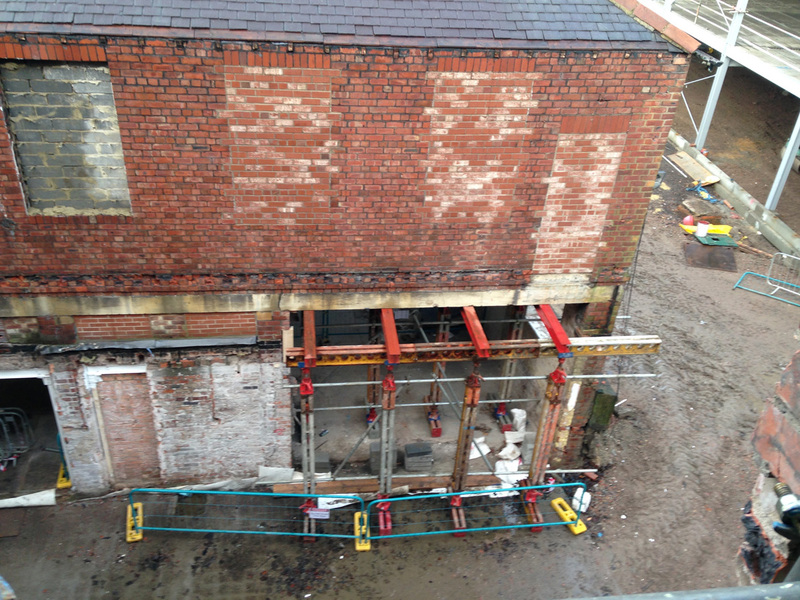 The north staircase is still in position on 8th October 2015. By October 29th, the beautiful old wood north staircase was sadly no-more – which still hurts a lot – though the fanlight was still in situ. By November 29th, only the fanlight remains. On November 29th, Giuseppe photographed the fanlight from the roof. Although in my time at Church High the plastic never let in water, from this perspective the structure appears a lot more flimsy. It isn’t really surprising that it was eventually completely removed. The stairwell fanlight from the roof, 29th November 2015. Whilst I probably loved the Church High old building, in all its magnificent quirkiness, more than most, I have to admit the painstaking attention to detail of the renovation is admirable. Christine Sillis, EWA and Wates really are ‘future-proofing’ her. 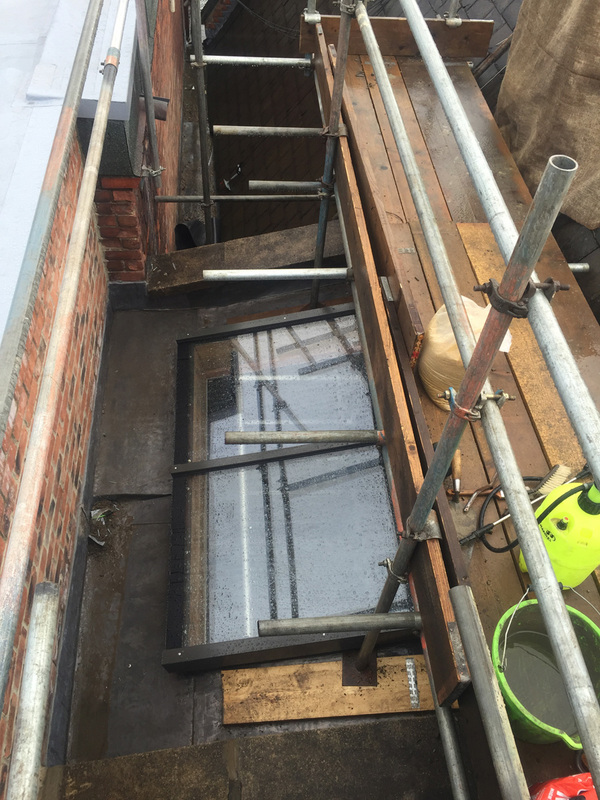 As Giuseppe’s photographs show, a sturdier glass fanlight has now been put in place. 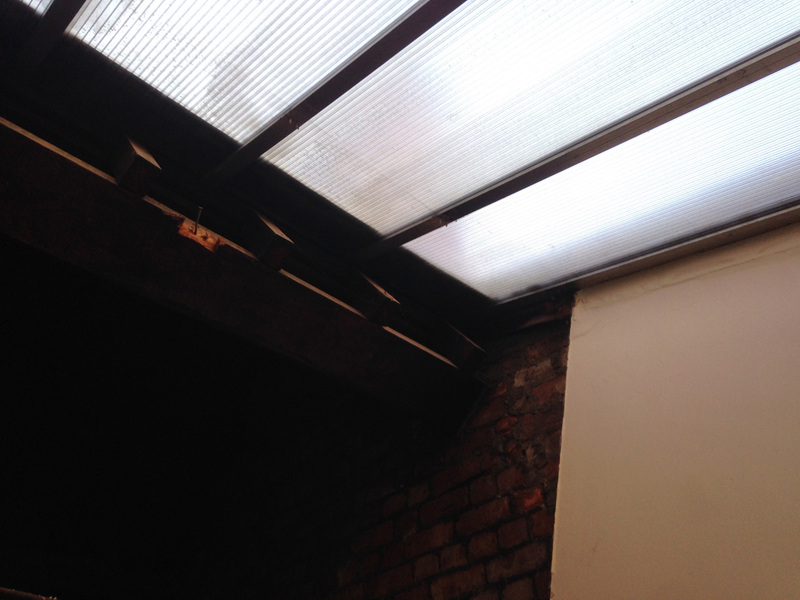 March: the framework for the new fan-light under construction, from outside & within. On April 20th, the leading was being added. 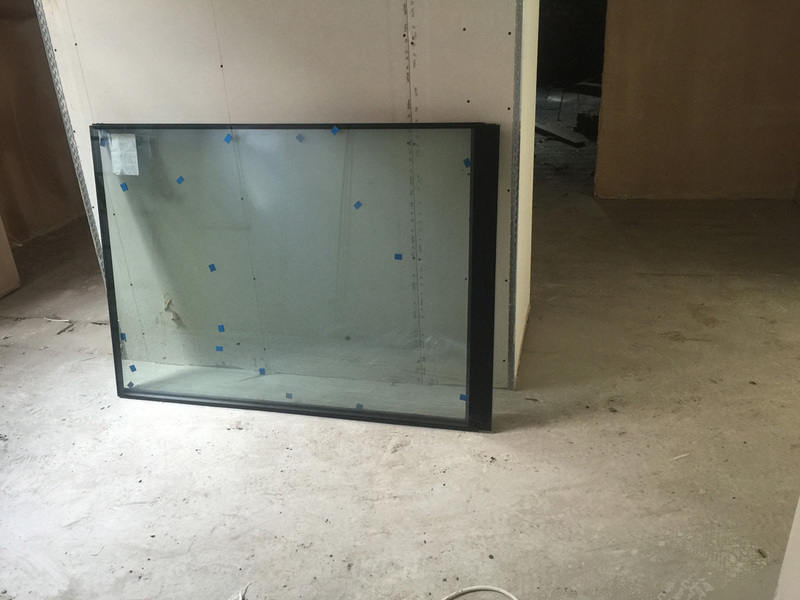 On April 26th, the glass panels were being fitted into place. By 1.00pm that day, the job was complete. I’ve observed this same attention to detail in the brickwork too. 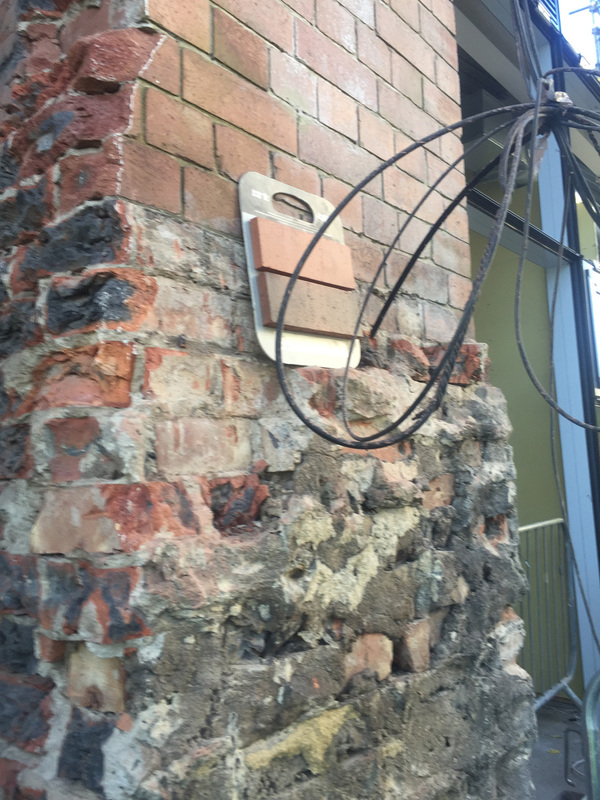 Where the building has been re-shaped in the past, the evidence was still there for all to see in the different colouring of the red bricks. A good example of this was in the side of the 1920s extension which used to be visible from the staffroom. 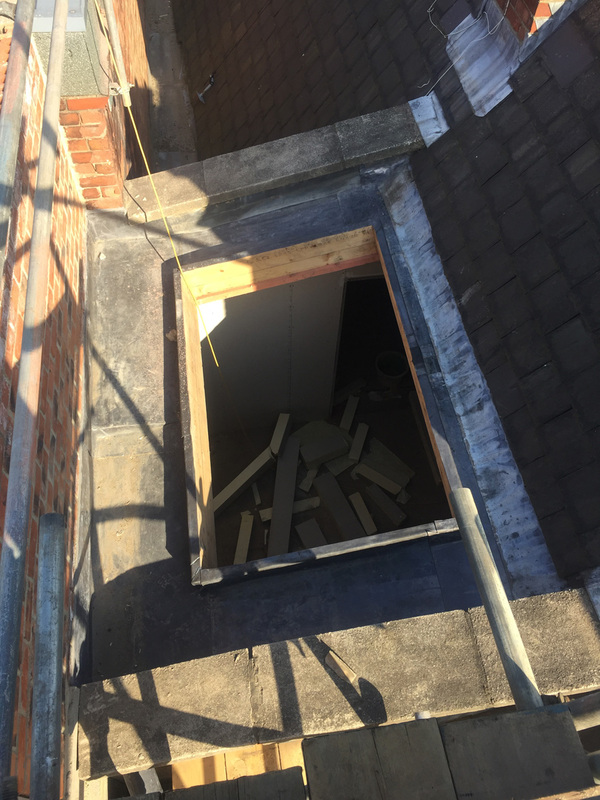 The lighter brickwork clearly showed where extra windows once were and also a back doorway which could be exited via a small flight of stairs on the kitchen roof. 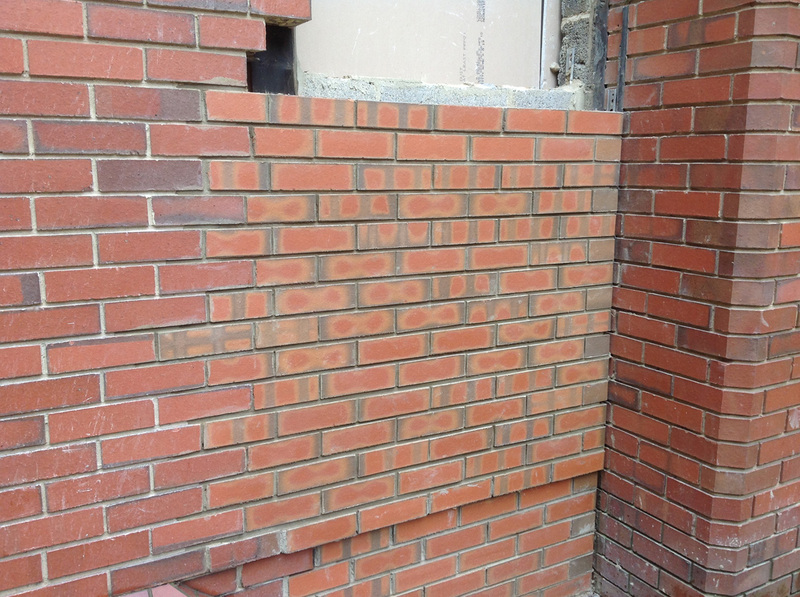 Replacement brickwork in the side wall of the 1920s extension before it became subsumed into the new glass extension. 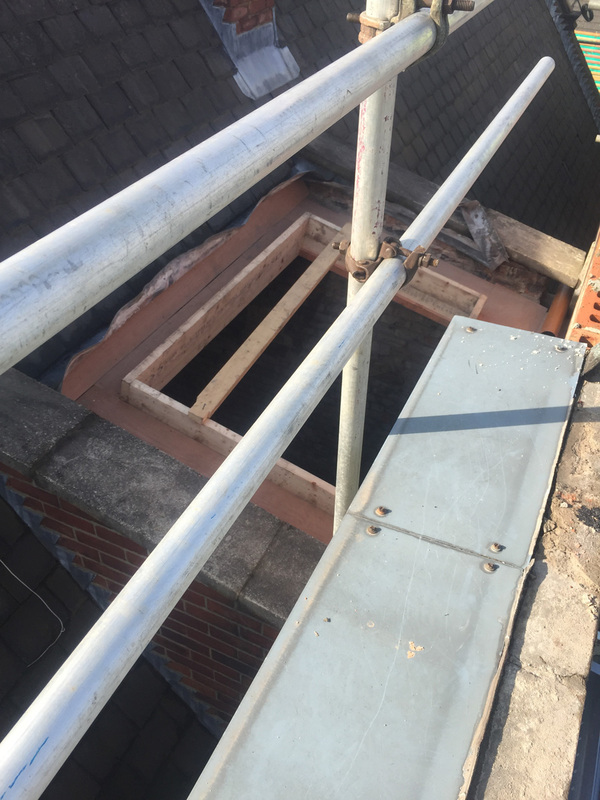 Wates are taking great pains to match up any new brickwork as close as possible, whichever part of the site they are working on and whatever the age of the adjoining bricks. I have seen good examples of this in the back courtyard and also the new Sports Hall entrance. 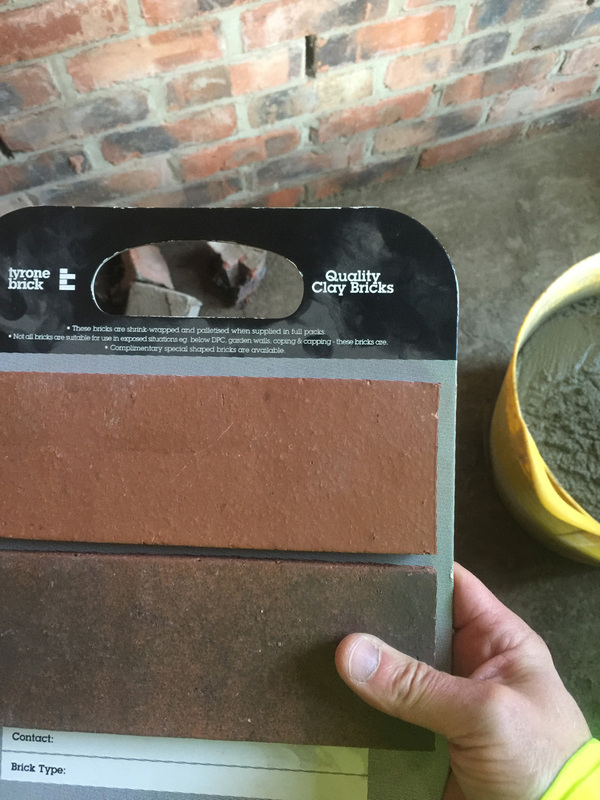 An outside doorway being bricked up in the back courtyard. 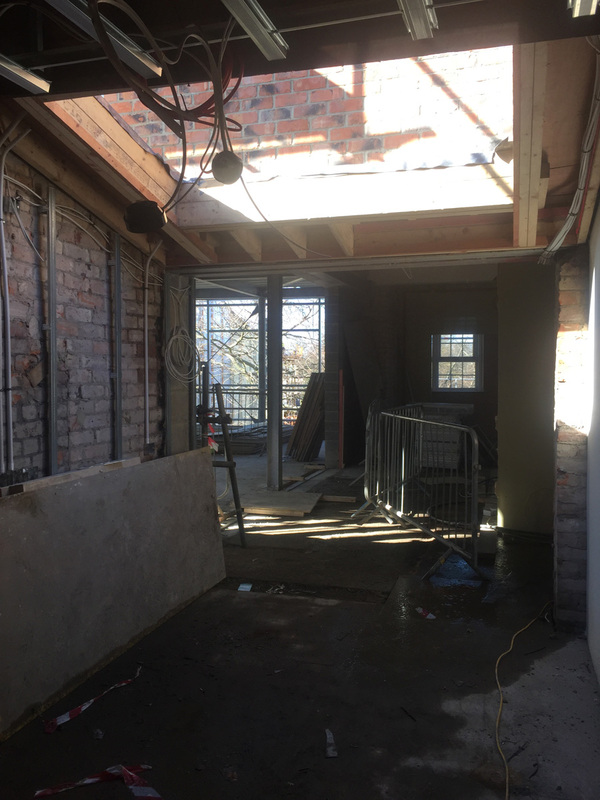 The area of brickwork needing building up again on April 21st was the edging of the new doorway which has been recently created in the north wall of the old building to provide access to the new build. 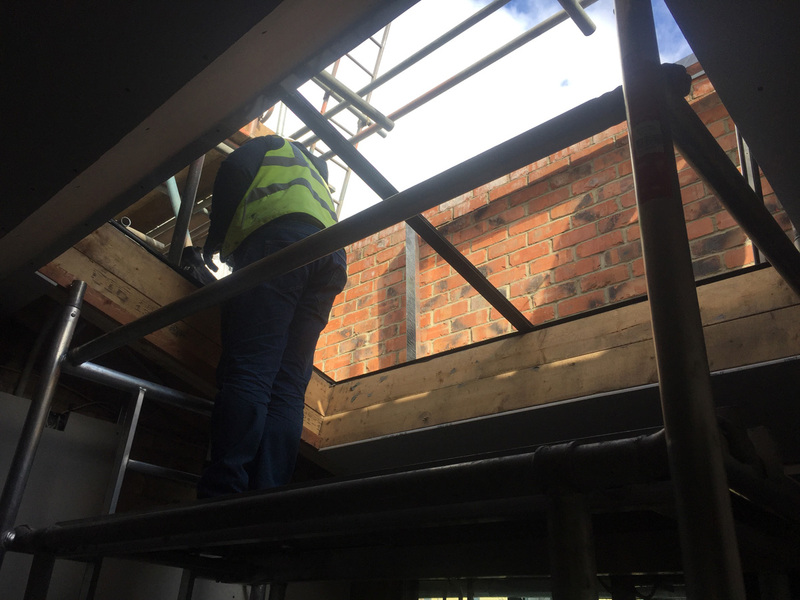 As Clerk of Works, Giuseppe’s job is to keep a close eye on things like this on a day-to-day basis as the project progresses. From a personal point of view, it is good to know the building is in safe hands. A ‘safe pair of hands’ keeping an eye on detail.